Stocks came under pressure on Thursday and that led to all four of the main indices falling. The Nasdaq got hit the hardest with a loss of 1.18% and it was followed by the S&P with a loss of 0.94%. The Dow dropped 0.87% and the Russell lost the least at 0.82%. Nine of the 10 main sectors fell on Thursday and it was the utilities sector that notched the only gain at 1.32%. The consumer staples sector had a small loss at 0.07% and the rest of the sectors experienced more significant declines. The energy sector took the biggest hit with a loss of 2.21%. The materials sector dropped by 1.38% and the tech sector fell 1.37%. Those were the three worst performances from the sectors. My scans continued to turn more negative last night with 143 bearish signals and not a single bullish signal—except the seven bullish signals on inverse ETFs and those count in the bearish signals. The barometer dropped to -99.1 from -62 and that is the worst reading since January 14 and the third worst reading from the past year. There were 10 charts on the bearish list that jumped out at me, but there was one in particular that caught my eye. 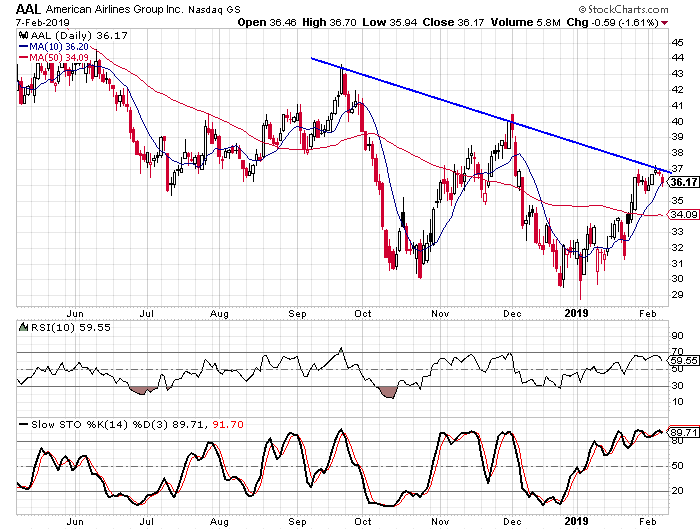 American Airlines Group (Nasdaq: AAL) appeared on the list and the company’s fundamentals are mixed. The EPS rating is a 33 and the SMR rating is a B. The company has seen earnings decline by 20% per year over the last three years. The daily chart shows how if you connect the closing highs from September and November the trend line they form is right at $37. That is also where the stock appears to have hit resistance this week. The stock is also overbought based on the daily stochastic readings. Buy to open the April $38-strike puts on AAL at $3.30 or better. These options expire on April 18. The options will double if the stock falls to $31.40. The stock dropped all the way down below $29 in early January. I suggest a target gain of 100% with a stop at $37.50.